At the beginning of the ‘90s, Edwig Van Hooydonck was one of the best Classics riders in the pro peloton, winning the Tour of Flanders and Brabantse Pijl after some wonderful performances. Two decades later, another member of the Van Hooydonck family is prepared to have his name engraved on the Honour Roll of the cobbled Classics. He is Nathan Van Hooydonck and he made sure of showing his potential in a couple of races from the Junior ranks, before passing to the U23 level, in 2014. A fine time trialist, with impressive results also in the one day races, Nathan Van Hooydonck will race next year for Bissell, under the guidance of Axel Merckx, who helped many of his riders from the previous seasons to get in the World Tour. That is also one of Nathan’s objective, who talked about his dreams and future goals in this exclusive interview for Cafe Roubaix. – Nathan, how did you start cycling? I used to be a football player, but I wasn’t really good at it. So one day I decided to try something else. My one year younger cousin started cyclo-cross already, so I tried it to and liked it a lot. I wasn’t the best, and I finished at two or three minutes from the winner, named Mathieu Van der Poel. My daddy bought me an Eddy Merckx cyclo-cross bike and I started cycling at my former team Hoboken WAC. This was the beginning of a new part of my life. – Did your uncle influenced you in any way or he preferred to let you find your own path? My uncle was kind of an inspiration for me to continue cycling. He never pushed me and my cousin (his son). We started working with a trainer in 2010. Jeroen Dingemans from the 185 coaching centre Marc Herremans is still my trainer. My uncle gave me some good tips for Paris Roubaix this and last year. He is still an inspiration to become a pro in a few year. I hope I can reach what he reached. – Do you have any rider you admire or with whom you would like to resemble? I really like Fabian Cancellara. The way he rides his bike and the way he talks to his fans. That’s wonderful. I think I am also the same type as him. He is a time trail rider and a classic rider and me to. Only he is still a lot more powerful then me. – 3nd in the Tour of Flanders and 2nd in the Paris-Roubaix are some of your best results so far. How was to feel the taste of these Classics, even if as a Junior? This year I realized I’m not a real climber like other rides in my category, for example Mathieu Van Der Poel, Laurens De Plus and Tao Geoghean Hart. I think I’m more a classic rider like my uncle. Races like Liège–Bastogne–Liège are also good for me. I want to keep on working to the Classic races, because I think it’s my speciality, but the time trail will be important to in the coming years. – Is this your biggest dream, to win such a race as a pro? Or do you have other dreams? Yes, my dream is to win races like Paris-Roubaix, Tour of Flanders and Brabantse Pijl. Those are the races that I really like! – How were the World Championships in Firenze? I know you had some ambitions for the individual time trial, but finished only 17th. The World Championships were a bit disappointing. I was a little sick when I left Belgium, and I didn’t felt good. The first two kilometers in the time trail were at a really high level, but afterwords I started feeling ill and I never had the same feeling as in the beginning again. I think when I’m not ill I can ride ten seconds faster and finish in the top ten. The parcours wasn’t also my thing. – And at the other end, what was your best moment of the season? 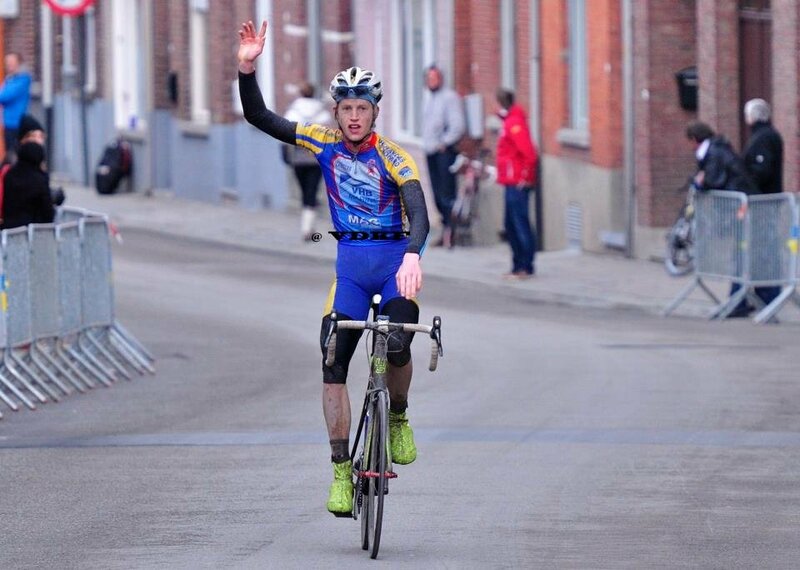 Winning the Keizer der Juniores race? My victory at Tollembeek was a nice one, I rode 70 kilometres alone and won with an advantage of 2:30. The race at Keizer der Juniores was also nice, because of the many good rides who were at the start. Another nice moment wasn’t a victory, but the world title of one of my best friends, Igor! He made my day better! – Next year, you will ride for Bissell. What do you think or what do you hope this change will mean to you? I think I can learn a lot from Axel and the other riders. It’s a good team to develop myself over the years. – Riding for Bissell will mean racing in the U23 ranks, but also in some races with World Tour teams. What will your objectives be? The first year I won’t ride any World Tour races, because I have to go to school, and that makes traveling to the United States a bit difficult. What the coming years will bring, we’ll see.